Here's a rather novel idea out of New York City: Mayor Michael Bloomberg suggested recently that low-income New Yorkers who make good choices--like staying in school or visiting a doctor on a routine basis--should be rewarded with cash payments. The rewards would incentivize continued proactive behavior while helping individuals and families break out of the cycle of poverty that traps people for generations (USA Today, September 22, 2006). The notion has been successful in countires outside the United States. The World Bank has used the tactic in Mexico and Brazil with great succcess. Bloomberg propsed the innovative action after receiving a report from the city's anti-poverty commisssion. the commission was led by Time Warner CEO, Richard Parsons and Geoffrey Canada, preident of the Harlem Children's Zone. Parents who take seriously getting their children to school and the doctor's office help the entire city, while lifting their families. Linking such decisions to financial assistance would have a double impact on the poor. Bloomberg's plan would not use public funds. The cash rewards would be raised from private sources. The initial goal would be to put together a $24 million fund to reward and encourage citizens to pursue education and health care for themselves and their children. The plan to reward personal and parental initiative drew positive reactions from a number of New York City officials. Sports, like every other human reality can become extreme. And, I expect professional football falls into that category by just about any definition. Still, the rallying focus provided by the New Orleans Superdome is an undeniable fact for a city still in crisis. Monday night was an amazing time for a city badly in need of anything positive. I need to celebrate this important milestone in the return and renewal of a city I love. Football is really not all that important. But people longing for a way to connect and identify with one another and with a new beginning discover hope, joy and fun in anything an entire community can rally around. 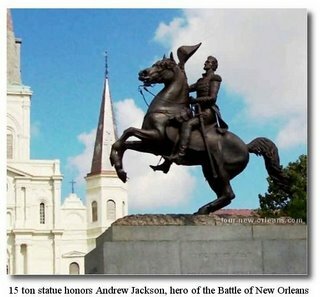 Last evening I spoke to a good friend who grew up in the New Orleans area. His family still lives in South Louisiana, though Katrina forced them to move to Baton Rouge during the past year. His assessment about the Saints game lined up with mine. Cities, like people, require hope. 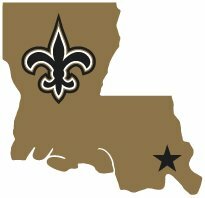 Today I am thankful for the New Orleans Saints. Not because of football, but because of my own longing to see this great city restored and renewed. I guess I just left too much love and appreciation there for the city and its people when we moved away almost 30 years ago. Moving forward regardless of the system's "issues"
Systemic forces concern almost everyone who works on the issues and the challenges associated with poverty. It doesn't take long before you reach the place where these forces are very easy to recognize. I talk frequently about systemic matters here. That said, what do we do in the meantime? In that long meantime before those forces and policies are overcome or replaced by better and more just rules and approaches? What do I do today with what I have within my control? When Jim Collins first published his best selling business book, Good to Great: Why Some Companies Make the Leap... and Others Don't (2001), I grabbed it and enjoyed reading it. As I read, it became clear to me that much of what he reported on how forprofit companies become truly great over a long period of time had all sorts of parallels and applications for the nonprofit world. Now Collins has published a monograph, Good to Great and the Social Sectors: A Monograph to Accompany Good to Great (2005), intended to accompany his earlier work. He applies his learning to what he observes from working in the non-profit or "social sector" since publishing the longer work four years earlier. What follows is his answer to what non-profits should do in the face of difficult systemic realities. I am encouraged by his words, because he does not dismiss my concerns over systemic matters. At the same time, he calls me to work on carving out organizational excellence in that space we call the "here and now." I've conducted a large number of Socratic teaching sessions in the social sectors, and I've encountered an interesting dynamic: people often obsess on systemic constraints. At a gathering of nonprofit healthcare leaders, I innocently asked, "What needs to happen for you to build great hospitals?" "The Medicare system is broken, and it needs to be fixed," said one. "Those who pay--insurers, the government, companies--are not the consumers, and this produces a fundamental problem," said another. "Everyone believes they are entitled to world-class healthcare, but no one wants to pay for it. And 40 million people have no insurance." The group poured out a litany of constraints. "Doctors are both competitors and partners." "Fear of lawsuits." "The specter of healthcare reform." I put them in discussion groups, with the assignment to come up with at least one healthcare organization that made a leap to sustained and superior results. The groups dutifully went to work, and most came up with at least one solid example. Next, I said, "Now go back into your groups, and for each of your positive cases, try to identify an organization that faced comparable circumstances--location, demographics, size, and so forth--but that did not make the leap." The groups went to work, and for the most part identified candidates. "So," I asked, "how do we explain the fact that some healthcare organizations made a breakthrough, while others facing similar (if not identical) systemic constraints did not?" . . .It might take decades to change the entire systemic context, and you might be retired or dead by the time those changes come. In the meantime, what are you going to do now?. . . You must retain faith that you can prevail to greatness in the end, while retaining the discipline to confront the brutal facts of your current reality. What can you do today to create a pocket of greatness, despite the brutal facts of your environment? . . .I do not mean to discount the systemic factors facing the social sectors. They are significant, and they must be addressed. Still, the fact remains, we can find pockets of greatness in nearly every difficult environment. . . . Every institution has its unique set of irrational and difficult restraints, yet some make a leap while others facing the same environmental challenges do not. This is perhaps the single most important point in all of Good to Great. Greatness is not a function of circumstance. Greatness, it turns out, is largely a matter of conscious choice, and discipline (Good to Great and the Social Sectors, pages 29-31). Lights back on in New Orleans. 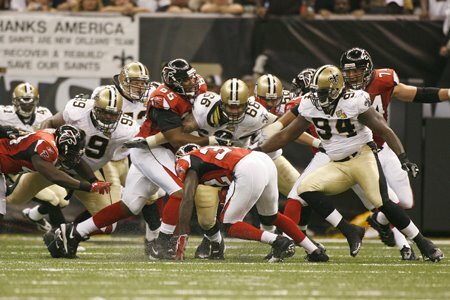 . .
For the first time in almost two years the lights burned brightly last Monday night at the New Orleans Superdome. U2 and Green Day showed up with thousands of fans and citizens of the troubled city. About a year ago we were all thinking hard and arguing passionately about the city of New Orleans in the aftermath of Katrina. 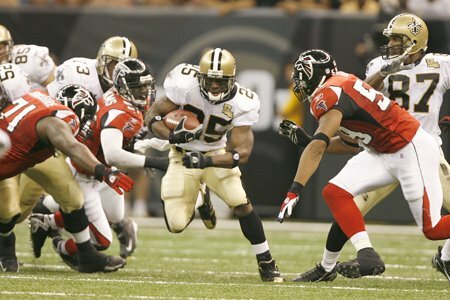 At last football fans, in person and via ESPN's Monday Night Football, converged on the city and the Superdome for the game between the over achieving New Orleans Saints and the solid Atlanta Falcons. 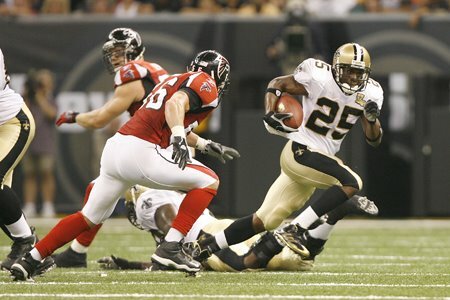 The Saints prevailed in the game 23 to 3. I loved the outcome! 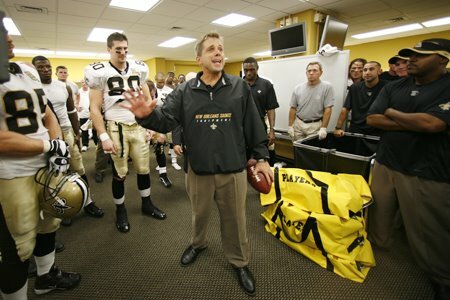 When we lived in New Orleans, I joined the ranks of die-hard Saints fans, even when we referred to them as the "Ain'ts." We were there five years--great years. Hank Stram coached the team. I remember very well leading the team in chapel services prior to a game with the Philadelphia Eagles. As I recall, my prayers didn't help much that day. But, I can tell you it was thrilling to me, a young, 25-year-old minister just to be in the house with the team! I have a Saints helmet hanging in my office today, even here in Cowboy country. During the off season, we would run into the Archie Manning family--including Peyton and Eli when they were just little fellows--at a local cafeteria on Sundays after church. Er, sorry. . .back to Monday night. Throughout the game it was clear that the fans carried the team with their unrelenting heart and soul. The Falcons should have won the game, but the fans simply would not allow it. It was amazing to watch and listen. The renewal of the sports arena has given the people of New Orleans hope and a common rallying point. 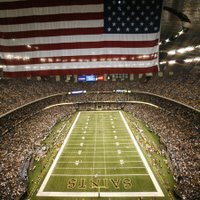 Every seat in the building has been sold out for the entire 2006 Saints home schedule. Eat your heart out, Jerry Jones! Clearly, the Saints are back! I wish I could say the same about the city. More than a year after the Katrina tragedy the city has no comprehensive plan for rebuilding the thousands of homes lost in the storm. Those of us who have walked the neighborhoods can't get the images of complete devastation out of our minds or our dreams. The Superdome has been restored, thanks to an investment of over $185 million dollars. Monday night we all watched with gratitude. 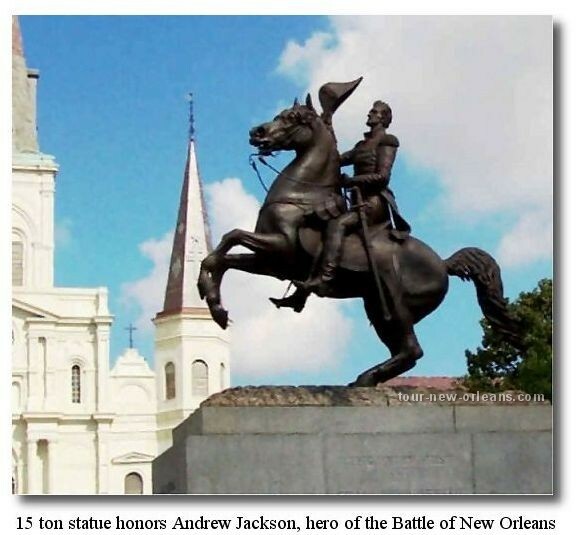 Way to go New Orleans! What has happened to the Superdome sports arena needs to spread out across the rest of the city and the entire region. But, it cannot happen, it will not happen without a national commitment to rebuild the city of New Orleans. Where is a reprise of a Marshall Plan-like approach to renewing this important, but devastated American city? As I see it, we must keep asking and asking until we receive a satisfactory answer. As Spike Lee said at halftime Monday evening, "it ain't right yet." Three or four hours at a wonderful community event and then back to the FEMA trailer just doesn't sound like the best we can do. What do you think? Surely we have not come to the place in our national civic life where we simply allow a great city to disappear, have we? Every major urban area in America should be watching and listening for an answer, a national answer. Jenny Fogel works in our Development Department and she also serves the community as one of our lawyers at the LAW Center here at Central Dallas Ministries. What follows is a part of her journal reflections from Monday's experience of going without meals as a part of our Hunger Awareness Day. I am hoping that many readers here joined us yesterday or, if not, will decide to engage in a day without food during one day this week and then donate what is saved to our Blog Campaign (see upper right corner here--for each $1,000 raised from this appeal, we will paint another house green--details can be found by clicking on the thumbnails). You can also read more about our hunger awareness day by returning to my post on Monday, September 25. Please consider joining us. We need your help. 7:53 a.m. Just arrived at work and am already starving! I’m a breakfast person, and this is going to be tough! I’m just trying to imagine all the little kids in our city today who went to bed hungry last night, will wake up hungry this morning, and will still be hungry tomorrow, long after I’ve filled my stomach again. 9:24 a.m. Okay. This is tougher than I thought. My stomach is already growling, and it’s not even 10:00. I just drank some juice to get energy. People who truly have nothing don’t even have juice! 10:40 a.m. The juice helped. For about half an hour. Back to feeling very, very hungry. 11:45 a.m. This is when I would ordinarily be eating lunch. It’s amazing—I would pay $20 for a Subway sandwich right now. It’s incredibly hard to focus when you’re this hungry. I can’t even imagine trying to function well in school or at a job with nothing to fuel your brain. It’s amazing how many people are forced to do that every day. 1:18 p.m. My stomach actually hurts right now. Not just the empty, growling feeling, but it actually hurts to not have any food. So hard to concentrate! 2:50 p.m. I wish the entire country would do this for a day. I won’t soon forget this feeling. It makes me want to drive up and down the streets of Dallas to give food to every single hunger adult and child. Nobody should have to feel this way. 3:26 p.m. I’m feeling pretty lightheaded. My stomach no longer hurts, but it’s just generally kind of an empty, exhausted feeling. And it hasn’t even been a full day yet. 4:50 p.m. I broke down and had some applesauce. My rationalization is that since I didn’t really have to chew it, it doesn’t count as food. But I know that it does. I can’t imagine what it must feel like not to have the option of even a little bit of applesauce. I keep envisioning parents feeling physically poor themselves and having to combine that with the anguish that comes from watching their beautiful children go through the stages of hunger that I’ve experienced today. 5:23 p.m. Okay. I have a new term. “Hangry.” It’s a combination of “hungry” and “angry.” I’m hungry from lack of food, I’m angry from my own lack of food and from the fact that hunger exists like this every day for thousands of people right here in Dallas, Texas. I think we should do this every year. I don’t think it’s that people don’t care about those around them. I think it’s just that they don’t really get it. When you remove hunger from the theoretical realm and place it into your own reality, it really opens your eyes. And makes them sting with tears. On Monday, September 25, thousands of people will skip breakfast, miss lunch and go without dinner. They will go to bed hungry. We ask you to join them. For this one day, try to go without food. Share in the pains of hunger that many of your neighbors experience daily. Then, we ask you to donate the amount that you would have spent on food that day. For every $1 you donate, CDM can secure 7 pounds of food. Donating the cost of your lunch could provide nearly 100 pounds of food to the community! Please join us on September 25, 2006 for "Community Hunger Day." Nationwide, hunger has increased by over 43% since 1999. Children go to school hungry. Their parents show up to work with empty stomachs. Their grandparents skip meals to afford medication. Hunger is a daily reality for millions of Americans. You can help them today. For over a decade, Central Dallas Ministries has operated one of the largest food pantries in North Texas. This year, over 10,000 more people have come to CDM in need of emergency relief than in 2005 -- an increase of over 40%! This staggering growth completely depleted our food supply earlier this month (see photo of shelves above). We need your help to meet this all-time high. Even if you cannot donate at this time, we encourage you to join us for this important moment in the history of our community. Please consider going without food for this one day, and encourage your friends and family to do the same by forwarding this email. Thank you for standing alongside your struggling neighbors. Together, we are building a genuine community... one person at a time. Sign up for the campaign today. During my first Christmas season at Central Dallas Ministries, a generous North Dallas church provided gifts for 125 low-income families. About a week prior to Christmas day the recipient families arrived to pick up their toys and packages. The entire process was highly organized. Our building was large enough to accommodate about 25 families at a time. So, we hosted five different groups during our day-long party. The day was bitter cold. We served hot drinks and cookies and the families received large bags of toys and clothing that were labeled with their names to move the project along smoothly. All in all, the day turned out to be a bitter/sweet experience for me. On the one hand, the families were very happy to have a place to get gifts for their little ones. They were very polite and appreciative. On the other, you could see and feel their embarrassment over having to stand in line and depend on others to provide for their own children. They had to accept what was given without any say or choice in the matter. At the end of the day, I made an internal pledge that we would never do Christmas this way again at CDM. The following year, during late summer, we kicked off a new process. We began recruiting members to our newly formed "Community Service Corps." Members of the corps agreed to perform various acts of community service in schools, nursing homes, parks, and in a number of our locations around the city. In exchange for their hard work CDM agreed to pay Corps members $10 per hour in "Christmas Store Bucks"--we printed our own money for this purpose! We kept careful payroll records on each member. Then, in November, we began collecting new clothing, toys, sporting equipment and other gift items from supportive churches, civic clubs and interested individuals. About two weeks prior to Christmas day we opened our version of "Toys R Us" in our headquarters building. That first year we recruited 109 members for our Community Service Corps. We had a great payday celebration and the members came into our store and spent their hard earned money to purchase toys, clothing, household items and other gifts for their children and family members. The store operated exactly like a store. We gave away nothing. Every item was priced for sale. Every shopper chose the gifts they wanted to buy for their children and loved ones. The entire project turned out to be a great success. Our store was not about charity. Only a sense of pride as the result of three months of hard and significant work that paid off. The next year we employed 226 Corps members. The third year we signed up almost 400 workers. During that third year, we learned a very important and fundamental lesson about retail. If you have purchasing power of almost $250,000 coming into your store, you need about three times that much inventory to take care of customer demand and the issues of product choice! After that third year, we realized that we needed to make a few important changes. What we wanted to do was to ask our supporters in the churches, civic clubs and other organizations to simply donate cash so that we could change our payroll process in an important way. Instead of paying our Corp members with money we printed for use in our "Christmas Store," we needed to purchase gift certificates for our team members from local retailers like Target, Marshalls and the real Toys R Us. We knew that we could buy them at a significant discount thanks to the number of gift certificates we would need. The problem we encountered was disappointing. Our supporters didn't want to give us money. Rather, they wanted to buy toys and other gifts. They wanted the experience of shopping for the poor with their own families. As a result, we discontinued our Community Service Corps and our "Christmas Store." One story from our experience I will never forget. There was a little boy, about 10 or 11-years-old, who had been left with neighbors for Christmas. His family had returned to Mexico to attend to family business--an illness, as I remember it. They had to leave him behind due to limited funds. Toward the end of store hours one evening, 3 or 4 women who knew the little boy and his situation approached our store manager and asked if the store could give the little boy a bicycle. The manager explained that we were running a store and that we didn't give toys away. As she discussed the situation further, she noticed that the women appeared to be finished with their own shopping, but each still held Christmas Store money in their hands. She asked the women if they had finished their shopping. They told her that they had. 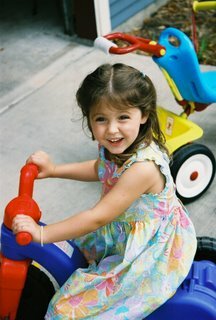 She then suggested that they pool their left over funds and buy the little boy, their neighbor, the bike they knew he wanted. This is exactly what they did! How proud they were and, I am sure, the little boy was thrilled and grateful for such good friends. According to Saint Paul, Jesus once told his followers that "it was more blessed to give than to receive." If that is true, and I believe it is, an even greater good is any act that places another person in a position where he or she can act as the giver. Placing parents in a position to provide for their own children is far better than stepping in and giving in their place. Renewal is more demanding than relief, but the pay off in community development and health is more than worth the cost and effort. "Mommy, I'm going to follow you!" Gracie, my incredible 4-year-old granddaughter, is really into her new Sunday School class. Evidently, the class has been studying the concept of "following Jesus." Her teachers have encouraged her to follow Jesus as she lives her young life. Heady stuff for a pre-schooler, don't you think? On Monday, Gracie talked to her mom about the matter. "Mommy, you know lots of people follow Jesus," she said. "Yes, I know, Gracie," Jennifer replied. "Mommy tries to follow Jesus, too!" "Well," Gracie responded confidently, "Mommy, I'm going to follow you!" 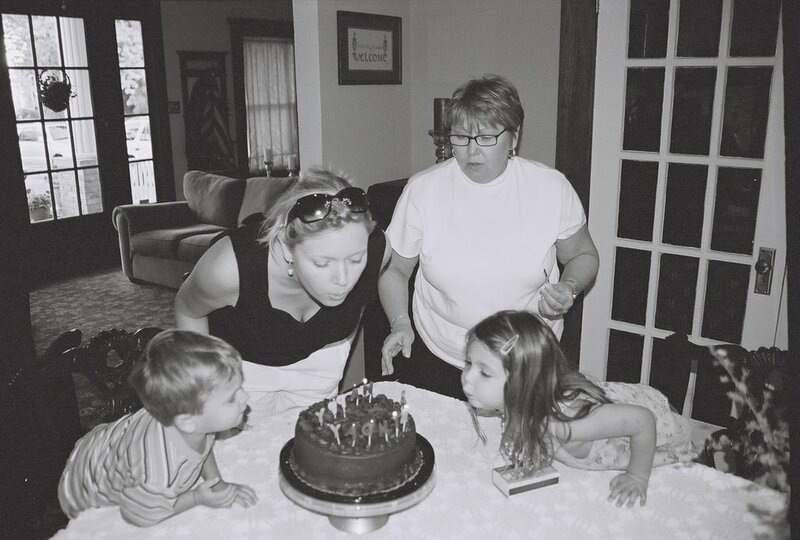 Parents take note: children begin their life journeys following you, looking to you and believing in you just about completely and almost exclusively. What you get is usually determined largely by what they see and hear from you. Gracie, like just about everyone else, will come to follow Jesus or whomever, whatever is to be followed through life, largely on the basis of what she observes in those of us in her life who are both older and loved. She can't see or even really comprehend "Jesus" at this point in her story. She certainly can see her "Mommy." And, she is already trusting in her. I'm grateful for that truth. She is a blessed little girl to have such a mother. Someday Gracie will be thankful as well. When caring people encounter poverty--when we see "the poor," our first instinct is to provide some kind of relief. If a person is hungry, the remedy is a meal. If a person is cold or hot and homeless, the remedy is immediate shelter. If a person is far from home or lost on the road, the remedy might be clear directions or a bus ticket back to loved ones. Relief is important. It is necessary. Good Samaritans are needed in greater numbers, to be sure. The problem is, we often stall out at relief. We find it harder, sometimes impossible to take the next step or to move over into a new area of work when it comes to bringing long-term renewal to people who live in poverty. Renewal is so much more comprehensive. It involves large systemic realities. Renewal calls for extended commitments. Renewal cannot happen apart from complicated, human relationships and movement. Whereas, relief work can be exciting, straightforward, conveniently packaged and easily quantified (as in, "How many meals did we serve today, Fred? "), the work of renewal can be messy, hard, depressing, halting and not so easily measured as to effectiveness. Often, funding relief efforts is easier than finding support for the longer play of renewal. Renewal efforts take us places we never have been before to enter partnerships we never would have dreamed of! The renewal of life among the poor can become controversial, expensive and challenging. Relief can be turned on and turned off. Renewal involves a much deeper commitment. Relief is often about individuals. Those who work hard in the area of genuine renewal quickly learn that success is found most often in the midst of community and collaboration. Relief is necessary because of the harshness of life at times. Renewal is even more important. And, high quality relief work will always lead on to opportunities for individual and community renewal. The Good Samaritan asked no questions when he picked up the wounded stranger on the Jericho road. That is the nature of relief. But for renewal to set in, someone must ask tough questions--questions about why others found it so easy to simply pass by on the way to church, questions about what made the road so treacherous in the first place, questions about how to avoid such misfortune going forward. Compassion leads us to relieve the pain of our fellows whenever and however we can. This same compassion should root us in a commitment to justice that sweeps us into the harder work of renewal among and with "the poor." Whenever the issue of homelessness comes up in Dallas (probably true in every major city in the U. S. ,come to think of it), someone begins quoting crime statistics. It doesn't help that just this week we learned that Dallas, Texas is the most dangerous city in the U. S. A. in which to try to live! The safest major American city? New York City! But, back to the stats. The attempt to link crime and its growth to the homeless population in a city like Dallas is not fair, nor does such a connection line up with reality or experience. Homeless persons, if they commit crimes at all, typically commit petty misdemeanors associated with the fact that they don't have homes. Their "crimes" are not violent and genearlly not related to property violations, except to find a place to lie down for a bit. Turn the page with me. I've met and talked to lots of men on the streets of Dallas who don't panhandle. They also wouldn't think of coming to an aid center like the one we operate in East Dallas. Way too proud for that. They are determined to "make it on their own. " Wonder what would happen if they all went away? One thing I know for sure, discarded aluminun cans would be everywhere! Our homeless population cleans up the trash and liter on our inner city streets. 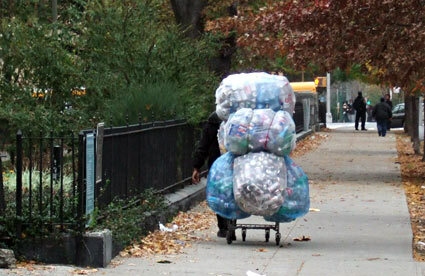 Picking up cans to sell for food and yes, for some, a drink or two, serves a good purpose for the rest of us. Reaching out the people on the basis of their value always seems to be the place to begin productive engagement. The fact is lots of homeless people work hard every day picking up at least part of our trash. Maybe more of us should stop and express our thanks. 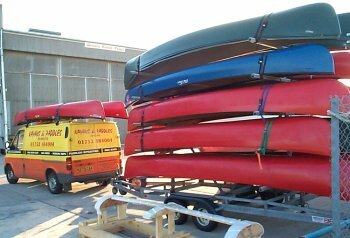 Canoes, manufacturing & hope. . .
Dallas needs a canoe factory. Or, at least that is what John Greenan thinks. John leads Central Dallas Community Development Corporation. He works extremely hard these days at getting several large, multi-family housing projects--one with a sizeable retail component--out of the ground, literally. By definition he is also concerned about economic development for the sake of those who, for all practical purposes, are shut out of the Dallas marketplace. John believes that our fundamental challenge is to learn to play the game of capitalism in a way that benefits the poor. That means that job creation will remain a priority. But, the jobs we need to create must be the sort that pay a livable wage. Back to the canoe factory. John is a canoeing maniac. He travels to participate in races and arranges family excursions to hit the rivers. He can be found on White Rock Lake and in White Rock Creek most weekends working out his stress in one of his several canoes. Not long ago he told me that he had found a canoe factory in Florida that was for sale. It turns out that when you buy a canoe company you are purchasing designs and patents. As a result, you can relocate a company like this just about anywhere. It can be a mail order, on-line, "phone it in" company. You can open a warehouse factory anywhere you choose. But here is the best part: employees of such a company would learn transferable, manufacturing skills and they would earn a wage that would allow them and their families to actually live! We may never bring the canoe company to Dallas. We dream a lot here. . . so, who knows? Maybe we will. But, John's thinking is on target. We have to play to the capitalism that makes our economy whirl. And, most importantly, we must find as many ways as possible to create jobs, real jobs, good jobs for the hundreds of people we meet every day who want to move up and on toward a better life. John's vision reminds me of the work of Harvard professor, Michael E. Porter. His extremely interesting essay, “The Competitive Advantage of the Inner City” (Harvard Business Review, May-June 1995), has shaped a lot of our thinking about what might happen in neighborhoods like ours. As always, the only limits are funding and time. Keep dreaming, John! We'll get there. A very special "Thank You". . .
Over the weekend we received a letter from a woman we met about two years ago. Enclosed was a donation of $25.00. When we first met, she was living in an old, abandoned house without running water or electricity. The situation was not good. But, she was homeless with no options. Like so many others, she came to Central Dallas Ministries for food and some help. And, like so many, she stayed to help her community by volunteering her time in our main Resource Center. She immediately began to make a real difference through her hard work and her very obvious dedication. Eventually, we were able to connect her through another volunteer to a really great church out in Richardson. We also helped find her more suitable, permanent housing and employment. She also was able to reconnect with her daughter during this time. But, as is usually the case in situations like this, she did all of the "heavy lifting" of getting back on her feet. All she needed was an opportunity and some new space for a little "traction." This small donation enclosed is just a way of saying "THANK YOU"! CDM has given me hope, compassion, support and love! No one else in Dallas would give me the time of day or night to help me get back up on my feet! Terry Beer for allowing me to come to the pantry to volunteer my time to help others in need. Also, for helping me with my needs. To: George for helping me to keep my thoughts positive and for asking me for the "THOUGHT FOR THE DAY"! To: Mama Alexander and James Reed for helping me to overcome my addictions and showing me that I AM STRONG and can OVERCOME! To: CDM Health Clinic for assisting me in my health issues (which I still go). To: Cyberspot for helping me to do a resume and directing me to my current employment at Adam's Mark Hotel! The construction is done and now I'm in building services desk work. To: Billy Lane and Terry Beer for my current home (I'll be here a year this month)! To: . . .Other Staff, THANK YOU FOR NOT JUDGING ME BUT FOR ACTUALLY CARING! P. S. To Mary Dooley, Ruth & Naomi Ministry and Richardson East Church of Christ! for this next step of living in Christ! The nature of our work here leads us to attempt a rather comprehensive approach to responding to the lives of the men, women, youth and children who come our way. It is always so good to see folks make progress. Please remember us and our friend today. Operating a non-profit devoted to changing the climate, feel and reality of entire neighborhoods turns out to be a real challenge. I mean one of those "lose sleep at night" kinds of challenges. A number of factors conspire to make this the case. 1. If you are successful during your growth and development years, you will begin to engage new partners and other organizations. New doors of opportunity will open before you. You may even have the advantage of merging efforts with other organizations in formal, as well as informal ways. We have taken a number of formerly independent organizations under our umbrella over the past decade. Growth will mean a larger team of community builders and the need for more funding. 2. As you are successful with your organizational expansion, public funds and institutions will begin to regard you as an ally and partner in the struggle to improve matters for low-income people. This could mean more funding for you, even though most of these funds will be tightly regulated and restricted in terms of how they may be deployed. Over the past five years we have received an increasing number of public dollars, all of which are restricted in this way. You build out your team even further and you grow stronger. As a result, you are able to accomplish more. And you set in motion a new cycle of opportunity. 3. Private funders will take notice of successful efforts by community-based non-profit organizations. A few really larger funders may approach to challenge you with unique opportunities to move into the upper levels of community philanthropy. I know this has happened to us here in Dallas. But with every blessing, there comes a new challenge. Presently, we are working with such a philanthropic group to fund the expansion of one of our most important efforts. The only problem is we now have a formal agreement that limits us in terms of approaching other funders and foundations for funding for other programs during this special time frame. So, a plus in one area can hurt us in several others. We face a couple of funding agreements and arrangements like this right now. At times the funding challenges remind me of a Rubix cube! 4. Large scale community change efforts cost enormous amounts of money. Take the affordable housing challenge in a city like Dallas. We have been working for several years on two or three notable projects. Again, the timing of the process can be frustrating beyond words. Funds "loaned" to one side of the organization must be recaptured at certain points in other processes. If one funding gate doesn't open on time, other parts of our work suffer. 5. The largest challenge we face in funding is the unrestricted donations for general operations. Most foundations, corporations and public funders want to direct their money to very specific projects. As an organization grows, the percentage of general or unrestricted funds usually declines. Take it from me, this creates all sorts of new challenges. Somehow I feel better getting this off my chest this morning! All of this to say, it is not a simple thing to really make an impact on the reality of poverty in a city like Dallas. We need more help from people who want to make a difference. We need more involvement, not less, from faith communities. We need more freedom to take aggressive and, at times, risky action to improve life for those at the bottom. We need a new army of partners to change the city. He was seated under a small tree near the curb of a busy street. Dressed in soft beige slacks and a white shirt, his head was topped with a white, straw hat. In his hands he gently held an electric guitar. I'm not sure how he powered the amplifier that was positioned beside him, possibly a battery unit. At his feet I noticed a large disposable cup to receive donations. I was part of the rather large crowd that made its way from Heinz Field back to the restaurants and hotels along 6th Avenue. It would have been easy to miss him. I was fortunate enough to be in a part of the crowd that squeezed right by where he was sitting. He played the guitar with ease and softness. He was a musician working on the street. I'm not sure why he stuck with me through the night until the morning. I suppose it is because I know he has a story. He was there because he knew that is where the opportunities and possibilities would be. Opportunities to make a few bucks to pay for another day of life. It had something to do with playing and the possibilities he discovered in his music so many times before. He had to play, to perform. Part of the street. Part of the life of the city. Part of his life that matters. He never looked up. He just played. 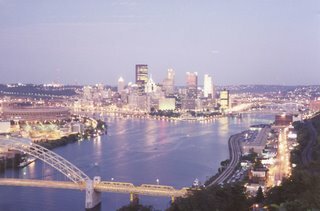 This is my first trip to Pittsburgh, PA.
Several things impress me about the city. It appears that a great deal of new investment has taken place in the downtown sector, and not just in the form of highrise office towers. Countless old, historic buildings have been restored and redeveloped. The streets bustle with people. The shops and stores and restaurants are thriving. No doubt, a number of public-private ventures have contributed to the renewal. I expect that there is much to learn here about the intentional development of civic space, life and spirit because evidence of success appears everywhere. All kinds of people are downtown--and lots of them! Business professionals, construction workers, service workers, medical professionals, students, the homeless--everyone is here. I realize I really don't know enough to make sense of what I am seeing, but it feels like everyone is glad to be here and everyone seems to consider the downtown space a common asset. At least people are together and it works! Last night before the Pirates played the Mets, we walked down a major street that had been closed for the game. People were everywhere. Again, all kinds of people--all races, cultures, ages, classes. Children, with parents in tow, were flooding into the park. 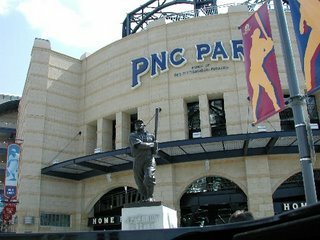 The Sixth Avenue bridge--renamed now for Pirates' hero, Roberto Clemente--was jammed with people walking out of downtown after work over the river to PNC Park. As I take it all in, I cannot help but think of Dallas and our Downtown district. Maybe it is the heat. Maybe it is the neglect of the past three or four decades, maybe it is a lack of vision. Maybe it is our classism and the widening gap between rich and poor. Maybe it is the way our community is so clearly divided along geographic, economic and racial lines. What I do know is clear: we must do better. I am proud of our plans for Downtown at CityWalk @ Akard! The project will make a small, but positive contribution to bringing valid, viable life back to our central business district. Cities can be healthy, encouraging and places of hopeful opportunity for everyone. It should be no other way! I know it's not perfect, but my hat is off to Pittsburgh. Baseball is community in miniature. Okay. So I'm a little crazy about this part of my life. I'll own up to it, gladly. There is just something almost "spiritual"--not trying to offend anyone here, honest--about sitting and watching and scoring and talking out of the side of your mouth so as to not miss a single move on the field. There is a community spirit at work here. The goal is to complete the diamond. The game demands teamwork, cooperation, confrontation, accountability, constant judgment, outcomes evaluation, forecasting and prayer with every pitch! Baseball is conducive to meditation, healthy boredom and simply slowing down the pace of things in an out of control world. Camaraderie is always afoot at the ball park--on the field, in the clubhouse and in the stands. Why, even the beer, popcorn, hot dog, cotton candy and nut guys are just happy to be on board! Baseball is urban, yet country. Increasingly shaped by technology, but playing out in a simple, "from the days of yesteryear" sort of way. I watch the Pirates whenever I can (which is seldom here in Texas)--it started when I was just a kid. Something about Bill Mazeroski's series winning homer in the bottom of the ninth against the Yankees at old Forbes Field when I was 10-years-old . Mazeroski's home run capped an improbable victory by the Pirates, who were out scored in the series, 55-27. The Pirates were shout out twice in their three losses, losing by scores of 16-3, 10-0, 12-0, while their biggest margin of victory in their four wins was three runs. So, I confess, I'm in Pittsburgh today. Tomorrow I watch the Pirates take on the Mets. It doesn't matter that they are 18 games out of first place in the National League Central Division behind the St. Louis Cardinals. . .doesn't matter at all! I'm just glad to be here and I'll be really glad when someone yells "Play ball!" Poverty and the Church. . . Many readers who drop in here continue to tell me that "the church should take care of the poor." Usually, this sentiment is expressed in opposition to the notion that sound public policy decisons and government institutions must play a major role in addressing the large issues associated with domestic and/or foreign poverty. For lots of people this question is fundamental and philosophical. Such a notion often reveals the sort of political theory that prevades many Evangelical churches. Here is a fact: in 2005, churches provided just 4.2% of our total revenue. So, I have some questions for church folk. What percentage of your church's total budget goes to address the needs of the poor in your community? around the world? What sort of programs or initiatives does your community of faith develop and offer in your community? Are they project oriented? Or, do they result in long term commitment to communities of need? How does your church respond to the health care needs of the uninsured, working people in your community? How many low-income persons receive health insurance coverage from your community of faith? How does your church respond to the affordable housing needs of your community? How many units of affordable housing did your church develop last year? What are your plans for the future? What does your church do to assist working people improve their skills so that they can command better wages in return for their work? Does your church provide comprehensive, social work case management for the poor who show up at the door of your sanctuary? What programs has your church developed to be present with children in after school situations, especially in the low-income neighborhoods in your community? How has your church responded to the mental health needs of your community? Has your church developed and offered drug and addiction treatment programs to your community? How many mental health professionals are on your church's staff? What sorts of programs has your church developed to meet the child care needs of two-income, working families? Of families headed by single parents? What does your church do to assist low-income, working families with rental and utility assistance? How many of these families do you serve annually? What level of scholarship assistance does your church offer to students seeking higher education opportunities from low-income families? What sort of mentoring, after school and academic advancement ministries does your church offer the community? Does your church offer any college prep courses (pre-SAT, etc.) for low-income students? Does your church or faith community have a plan to assist low-income working people with dependable transportation? How often at your church do you receive training for addressing the daily needs of the poor and the homeless in your community? Serious students of poverty and life in America will reach the conclusion that churches and other faith communities are simply not up to the comprehensive challenge of addressing the multiple problems facing poor persons and families in the United States without public assistance. To be sure, churches have an important role to play (likely material for a future post). But, poverty will not be overcome by the efforts of private sector players alone. What is needed is a multi-faceted assault on poverty with sound and aggressive public policy solutions playing a very large role. The posts I put up several days ago about what I would do if elected Mayor of Dallas prompted the conversation. I don't like self-promotion. So, forgive me here. But I am advised, by trusted friends, that some of the content of the interview might be useful to some of our regular readers here. So, listen in if you have the time and sufficient interest. The process was fun for me. The Internet is amazing, huh? A City Boy's Random Questions on Immigration. . .
How in the world would anyone manage to send over 12 million Mexican citizens back home in any sort of orderly fashion? What about children born in the U. S. who are citizens today? What would happen to them if their undocumented parents were sent packing to Mexico? What would happen to the real property owned by undocumented Mexican nationals--homes, land, businesses? What are we willing to do to help strengthen the Mexican economy so that citizens of Mexico would not need to enter the U. S. illegally in search of opportunity and better lives for their families? Why do people calling for "border security" with Mexico in view of the threat of terrorists entering the U. S. not express the same intensity about the long unprotected border with Canada to the north? How many strong advocates of deportation personally know an individual from south of the border who is here in the U. S. without proper documentation? How can a suburb like Farmers Branch, Texas have city officials calling for extreme measures against Mexican immigrants while also offering a "labor hall" for these same people to catch out as day laborers in an orderly fashion? Why have members of the U. S. Senate and House of Representatives decided not to work on immigration reform until after the November elections? Why are honest, hard-working people considered a threat to the security and economy of the U. S.? What would be so bad about every student in U. S. public schools working together to master at least two languages? Why wouldn't public school districts be happy to fund such an investment in student skills and intelligence enhancement? Why does the Social Security Administration continue to collect Social Security contributions on workers' accounts that are backed up by false and invalid Social Security numbers? What does President Bush understand about immigration and immigrants from Mexico that align him more closely with Democrats than with most members of his own party, especially in the House of Representatives? Why is the infant mortality rate among children of poor Hispanic mothers almost as good as that for the infants of much more affluent Anglo mothers? Why do so few residents of the State of Texas know the history of our state's dealings with Mexico from colonial days to the present? Why has the North American Free Trade Agreement not resulted in more benefit to the common workers in Mexico and Central America, not to mention the U. S.? What is the status of land ownership in Mexico? What sorts of reform efforts should be underway to help stabilize the Mexican economy by spreading the wealth among more of its citizens? Why doesn't Major League Baseball open a franchise in Mexico City? Why aren't there serious, on-going talks between the leaders of the Mexican government and those of the U. S. around the subject of immigration and mutually beneficial economic development south of the border? Why don't the states that share a border with Mexico become new industrial sites for American corporations so that guest worker programs might flourish more easily at a convenient and feasible distance from the homes of Mexican laborers? Could American corporations and investors develop alternative energy resources in Mexico that could create jobs and help supply energy to the U. S. in a manner that would be mutually beneficial to both nations? Why do so many Christian people read a bible that is filled with admonitions to honor "the aliens" and treat immigrants with fairness and justice and then turn to display hateful attitudes toward neighbors who are from another nation? Five years ago this morning I remember exactly what I was doing when the planes penetrated the walls of the World Trade Center skyscrapers. I was almost dressed for work. I had an 8:30 a.m. meeting at my office. I was watching the Today show when the network cut to the scene of the first burning tower. Brenda and I began speculating about how a plane could get off course, about how a small plane had once flown into the Empire State Building. We didn't know at the time that the first plane was a large airliner. As I stood in my bedroom watching the live video, I witnessed the second plane plow into the other tower. I made it to work for my meeting. Less than an hour later, when I emerged from my office, I learned about disastrous events at the Pentagon and the air crash in a Pennsylvania field. It was a horrible day. And, of course, the news got worse, more graphic and harder to receive. 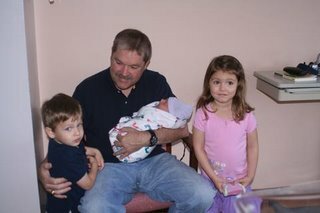 Five years ago we had no grandchildren--Gracie Bea was on the way, but she wouldn't arrive until March 31. When she arrived, the world had changed. Five years ago, I, like most Americans, didn't really understand what was afoot in the world. I had ignored and misunderstood previous events that now began lining up in a horrific manner. It is hard to comprehend the kind of hatred and commitment standing back of the terrible events of September 11, 2001. Today I have a need to be quite. So, I write here. 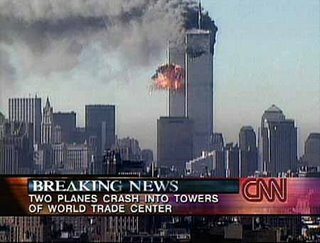 In the still moments of this day, I will remember those who died in buildings and on airplanes, including those who perpetrated the terror. I will remember those who lost their lives in serving others. I will remember those who lost loved ones and family members. I will remember those who spent months working to clean and rebuild and renew things for us all. I will remember our nation and our leaders. I will allow the memories of this horrid day to press what I believe is an important and necessary humility against my heart. I will remember my enemies, our enemies. I will consider our world, our entire planet--its complexities, needs, illness, injustice, longings and hope. I will pray for mercy, understanding and peace. I will embrace my idealism and my naivete and I will simply try to be still and quiet and open. In the quiet, I will simply remember. More on Labor. . . The Urban Institute just announced its publication of a new book that offers an agenda of reform for working Americans. Responding to the disheartening fact that wage inequality is widening and that many federal policies discourage some people from working, the book offers a strategy for how government programs should be reformed to encourage work and reduce economic inequality. In Making America Work, Jon Forman lays out a comprehensive national strategy for improving the economic benefits of employment and promoting greater economic justice. His recommendations follow crisp and thorough discussions on how market forces and government actions combine to determine the current rewards from work. "America works because it has achieved a balance between our desire to reward work and our concerns about economic justice," writes Forman, a professor of law at the University of Oklahoma. "But America could work even better." Showing how, Forman sets forth a slate of recommendations to reform America's tax, welfare, Social Security, pension, and health care systems, along with its labor markets. Forman discusses who in the United States is working, how the compensation system operates, how government decisions affect this system, and how far legislators and policymakers should go to reduce the unequal distributions of income and wealth. Forman maintains that when the free market's "distribution of economic rewards is unfair, it falls to government to adopt policies that promote greater economic justice. . . . Governments influence market outcomes through a combination of regulation, spending, and taxation." It is clear that Forman's thinking gets at some of the issues explored in this blog-community about labor, wages and the growing challenges facing working people in the cities of America. According to Professor Forman, current policies reduce economic inequality by about 20 percent, but that still leaves America with a high level of economic disparity. * Making Taxes Work: Get rid of inefficient tax subsidies and reduce tax rates on earned income. Restructure the earned income tax credit. Replace personal exemptions and standard deductions with universal grants. Abolish the tax system's many marriage penalties. Simplify the tax system and reduce compliance costs. Ultimately, integrate the income and Social Security taxes into a comprehensive income tax system. * Making Welfare Work: Reduce the high marginal tax rates on earned income for low-income Americans and eliminate the welfare system's many marriage penalties. Provide more child care assistance for low-income parents. Eventually, merge the tax and transfer systems into a single comprehensive system with low rates on earned income. * Making Social Security Work: Reduce the progressivity of the Social Security benefit formula while expanding Supplemental Security Income. Raise the early and full retirement ages. Tax Social Security benefits like pensions. In due course, replace Social Security with a two-tiered system, combining basic Social Security benefits to all older Americans with earnings-related individual accounts. * Making Pensions Work: Expand pension coverage and pay retirees in proportion to their productivity. Require pension plans to be age-neutral. Gradually make universal retirement savings accounts mandatory. * Making Health Care Work: Expand health care coverage, strengthen the connection between health care and work effort, and restructure health care markets. Provide nearly universal health care coverage at a reasonable cost and with a minimum of work disincentives. * Making Labor Markets Work: Vigorously enforce the laws against employment discrimination. Reduce incarceration levels. Expand education and training opportunities. Modestly raise the minimum wage and index it for inflation. Expand the unemployment insurance program. Strive to make full employment a reality. Lots to think about here, to say the least! But then, it is past time for us to think and, even more, to act to create a more equitable workplace for all Americans. Maybe what we need is a movement of compassionate, committed people who will not relent until change comes for working people in every corner of our society. For the record, Forman is the Alfred P. Murrah Professor of Law at the University of Oklahoma and vice chair of the Oklahoma Public Employees Retirement System. Before entering academia, Forman worked in all three branches of the federal government, most recently as tax counsel to Senator Daniel Patrick Moynihan. Making America Work, by Jonathan Barry Forman, is available from the Urban Institute Press for $29.50 (448 pages, ISBN 0-87766-731-4). You may order online at http://www.uipress.org/, call 202-261-5687, or dial 1-877-847-7377 toll-free. Billie Jo's rescue. . .
Two nights before last a car ran over Billie Jo. Billie Jo is a 70+-year-old woman who makes her home on the DART bench in front of the 7-Eleven at Gaston and Haskell here in our east Dallas neighborhood on the edge of Downtown Dallas. She makes a "closet" out of the space beneath the bench where she stores all of her belongings. I've know her for over 10 years. I've watched her sad slide deeper and deeper into mental illness, isolation and ill-health. Billie Jo and her predicament personify the frustrations of deep, unyielding poverty, coupled with homelessness, neglect and a deepening, at times self-imposed, mental illness resulting from inattention and her own inability to simply medicate herself properly. Over the years I've begged, pleaded, called the police, consulted with Adult Protective Services, prayed, cajoled, advocated and basically driven her really crazy trying to get her to agree to move into an apartment that we have offered to provide. And, I'm not the only one! Billy Jo has trust issues. Sometime Tuesday evening, Billy Jo got in the way of an oncoming car. Whether the car hit her head-on or backed over her is unclear. She came out of the encounter with a broken leg and a fractured shoulder. She was lucky to be alive. When quizzed by attending physicians, she didn't remember what happened to her. She was taken to the Baylor University Medical Center just down the street from her accident. Wednesday morning we received a call from a local rehab hospital that was trying to decide whether or not to admit her from Baylor. Even though we guaranteed that an apartment would be waiting for her upon discharge and even though she has Medicaid coverage, the rehab hospital decided not to admit her. Health care as a commodity just doesn't work for everyone, especially the poor. Thankfully, our loyal partners at the Baylor Health Care System came through again and admitted her to the hospital. I know we will be able to work out a rehab facility for her and we will finally get her back into a permanent housing situation. We will be able to help her get back on her meds. She will most likely stabilize and do much better. I'm not sure how she has survived the weather alone over the past 12 months. Bitter cold. Searing heat. Rain, ice, loneliness. Ironically, her misfortune may have added a few years to her life! She is a stubborn, willful, crotchety, at times sweet, old lady! She is a real hoot! She is a part of our community. She has worked in our Resource Center. She has attended the Central Dallas Church off and on for years. She may be an angel. The city has a way of encouraging belief in such "realities." I'm glad she has a chance to stay with us for awhile longer. It will be so good to turn the corner at the 7-Eleven and not see her sitting there, day and night, usually all alone and unreachable. My intention is not to turn my blog into a fundraising tool. I realize readers don't come here to read my funding appeals. So, I am committing to bring the financial needs of Central Dallas Ministries to this space on a very limited and infrequent basis. Earlier this month we did launch our very first "blog drive." Our goal is to raise $100,000 by October 31, 2006. The purpose: to buy food supplies for the thousands who come to our Resource Centers seeking assistance with groceries and to pay the State of Texas the acceptance fee for our low-income, housing tax credits ($60,000). Every penny will be devoted to these two needs--no administrative, printing, mailing, staff costs whatsoever--one of the great things about the Net! To date we are moving in on $18,000 in gifts! You will notice the little house icons at the upper right of this page. We paint a house green with each $1,000 raised. We intend to paint the entire block between now and Halloween with the paint brush supplied by this blogging community and its friends. As gifts have been streaming in from across the country, I've been thinking about a simple experiment. So, here goes. Here is the favor I am asking. If you have not made a contribution to our fund, please do so today. I am suggesting just $10.00. If you want to do more and if you are able, by all means do so. But decide to contribute at least $10.00. By the way, ten dollars will purchase over 71 pounds of food from the North Texas Food Bank here in Dallas! Next, and this is essential for our success, send this post and a personal appeal to at least 10 of your friends who work on the Internet and, if you have a blog, direct your readers to this space. Ask your friends to read the post, research my request here (they can click the thumbnails above the little houses for more directions and information) and send a donation of at least $10.00 themselves. I would love to be inundated with $10.00 checks, bills and on-line contributions! The power of the networking would be incredibly powerful and encouraging. So, help me touch people in need today. I will be grateful, as will my friends who need the help up from your hand. I've known Grant Boone for well over a decade. As a writer (check out his regular column, "Grant Me This," on the PGA website at http://www.pga.com/news/grantmethis/), a sports broadcaster (working with the Golf Channel and more recently TNT Sports) and a "life philosopher," Grant possesses rare gifts that always end up touching you where you live. His ability as a communicator is just about unmatched. From his voice to his brain, this guy cooks! But, what makes Grant so special to the people who know him best is his heart, his faith and his personal commitments in life. Grant is a family guy from start to finish. Nothing is more important to him than his wife, Amy and their children. His entire life is wrapped up in what is best for them. Many tough professional decisions have been made with this number one priority clearly in mind. Grant is the kind of guy you just want to know and be around. But, what really impresses me is his concern for folks who are "down and out" in everyone else's worldview. No telling how many friends Grant has. A good number of them are poor and homeless. Grant and Amy continually reach out to and engage people who find themselves in trouble in their hometown, Abilene, Texas. I had an hour with Grant last week while he was in Dallas and listened as he spoke of some of these special people who continually concern him. I listened to his vision for change in the lowest income neighborhood in Abilene. Every time I am with him, I come away inspired by his hopes and amazed by the kind of vision he brings to the challenge. I guess my main point here is simply this: everyone can make a difference in the lives of people who battle poverty. It is not really a matter of specialized knowledge or exotic training. It is all a matter of will, priorities, determination, surrender and openness to others. Grant brings that to his daily life. He is an extraordinary, ordinary guy with almost unlimited talent and many intriguing interests. But, he never loses sight of the direction his faith provides as he makes his way through his life. No surprise then, that he finds himself involved as a friend among the poor. Grant teaches me that everyone can make a difference and that living with an open heart can be transformative, personally and in a community. Mental Health Services. . .What Mental Health Services??? Steve Blow writes a regular column for The Dallas Morning News. He is always worth reading. On Sunday, September 3, 2006, Steve described his ongoing encounters with a homeless woman who normally "camps" for the day in the park just outside his office where he can observe her from one of his windows. Steve's piece begs the question, who is really insane here? This poor woman who faces the harshness of the streets all alone? Or, the rest of us who allow our city, our state and our nation to tolerate this sort of systemic, abject neglect? In my view, the woman may be mentally ill. The rest of us don't enjoy the luxury of that sort of justification for our behavior. Since the early 1980s, mental health funding and thus, services have been shrinking in Texas, as well as across the nation. The movement to "de-institutionalize" most mental health treatment services has much to commend it, at least in terms of theory about treating the mentally ill in a humane manner. The problem is, legislators and other policy makers took advantage of the change in treatment philosophy to slash funding again and again and again. Presently, funding for treatment, medication and case management has dried up to a meager trickle. Here, as elsewhere in our society, the poor suffer because we have decided to elect and to support policy makers who continue to deny needed benefits and care to the mentally ill. This is the issue. This is the point. This is why the woman Steve describes continues to suffer all alone. And yes, as Steve reminds us, she is someone's daughter. Does anyone care enough to work for change? I wonder if anyone is asking the candidates for Texas Governor what their positions are on care for the mentally ill? How about legislative change that would bring new funding? This is not just politics. This is all about morality, values and the quality of life we decide to create in our community. It is not enough to know about a problem. The real test of a people is always discovered in the action they decide to take or to avoid. Did you read the report last Monday? 1) American worker productivity, that would be labor, is up to an all-time high level. 2) American wages, that would be pay, is in decline. As a matter of fact, the current sustained economic expansion in the United States may become the first since World War II that fails to offer an extended increase in real wages for most workers. The median hourly wage for American workers has declined 2% since 2003. And, that, while average worker productivity--what an average worker is able to produce in an hour--has risen steadily during the same time frame. Today, wages and salaries comprise the lowest percentage of the gross domestic product since records have been kept. On the other hand, corporate profits have soared to their highest level since I was a teenager in the 1960s! Wages: shrinking in the face of great performance and growing wealth creation. To add insult to injury, the value of worker benefits, such as health care, is also in decline and incapable of keeping up with the rate of inflation. Average national income and consumer spending levels have continued to go up because of the earnings at the top of the economy, and because of the fact that so many of us work. To say the least, the benefits of the American economy are not shared or spread with an eye to anything approaching equity. The New York Times ("REAL WAGES FAIL TO MATCH A RISE IN PRODUCTIVITY," Monday, August 28, 2006, A13) quoted Goldman Sachs economists who summed the situation up by saying, "The most important contributor to higher profit margins over the past five years has been a decline in labor's share of national income." Political analyst Charles Cook put it this way, "There are two economies out there. One has been just white hot, going great guns. Those are the people who have benefited from globalization, technology, greater productivity and higher corporate earnings. "And then there's the working stiffs who just don't feel like they're getting ahead despite the fact that they're working very hard. And there are a lot more people in that group than the other group" (A13). No wonder the number of Americans falling off into the abyss below the poverty line is increasing. These are not issues to be solved by more charity. What is called for here is systemic change. These are matters of justice. Reading the words of Jesus or, more accurately, those who recorded his words can be unnerving. He seldom said anything that did not contain a challenge or some "stop you in your tracks" idea. For today, try these words on for size: Matthew 5:42. They come at the end of a paragraph placed in the first third of his famous "Sermon on the Mount." "Give to the one who asks you, and do no turn away from the one who wants to borrow from you. " Reading the "red letters" can be exciting, simple and very challenging. Who's up to their application? A baby and a butterfly. . . I'm not sure how I managed to be so blessed. But, it is definitely true that I am. Our two daughters and the men they married are "off the charts" in our opinion! Wonderful couples who bring us such great joy! I expect that we are like every other family in that regard. . .way proud of our kids. Then, of course, nothing prepares you for grandchildren. Here you see our two oldest grandchildren--Gracie Bea (4) and Wyatt James (2), the children of our oldest daughter, Jennifer, and her husband, Brandon Toombs. They are trying to decide what they think of their very first cousin, little Owen James (now almost 4 months who is trying to decide what he thinks of his two older cousins! ), the son of our youngest daughter, Joanna and her husband, Jordan Frazer. What a sweet, sweet time! 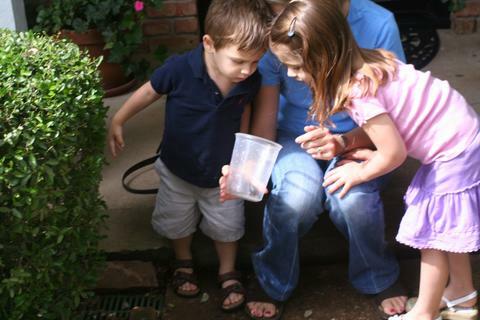 Then, there is mom and Gracie and Wyatt, on the very same day that baby Owen was born, setting their now fully developed Monarch butterfly free for its life. Significant "coincidence." Mystery and wonder all around. 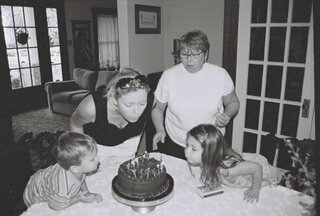 About one month later, Wyatt and Gracie enjoy "Aunt Jo" on her birthday, as "Granny" looks on. What a hoot! These children are beyond describing for me. Like all little ones, they are incredibly precious and worthy of our very best. Forgive me. I just had to share! I will send the rest of my life trying to let these little ones know how much I love them. Wednesday's report about the marked decline in area, state and national median income may not have come as any surprise to people who think about such matters ("New arrivals fuel drop in incomes," The Dallas Morning News, Wednesday, August 30, 2006, 1A). However, it did help explain the dramatic growth in individuals and families who show up at places like Central Dallas Ministries seeking assistance, opportunity and better living situations. In our Resource Centers from May through July 2005 year we served 8,000 families. This year during the same period, we served 13,000. From 1999 until 2005, median income (when adjusted for inflation) for Dallas County fell from $50,750 to 42,598, a 16.1% decline. Collin county, once among the wealthiest in the nation, saw median income drop by almost 15% over the same period. Nationally median income fell 6%. In Texas median income fell almost 10%. According to the latest census numbers, Texas is now the 5th poorest state in the nation. Robust population growth in the area continues to offset the decline in median household income for the economy as a whole. So, purchases are up and, along with them, sales tax revenues. The upscale businesses continue to thrive and the million dollar plus homes continue to be built at a record pace. Translation: the gap between rich and poor in our area continues to widen. Wages from the middle to the bottom remain basically static or worse. The escalation of gasoline prices, utility bills, consumer goods, health care and housing costs increase the downward pressure on the poor. Our times demonstrate conclusively that poverty is primarily the result of systemic forces beyond the control of the poor themselves. Poverty continues its growth, taking in more and more American families and children. If you are in a house of worship this weekend, listen carefully to see if the issue is even mentioned. I'd love a report next week.